Comedy's First Couple were busy hosts. As friends and neighbors of Hollywood's greats, you never knew who'd turn up next for a dose of Gracie's nonsense and a song or two from George. 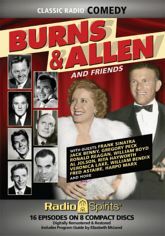 This 8 CD collection of hilarious half-hour visits to the Burns house features a galaxy of famous guests! Rita Hayworth, Frank Sinatra, Veronica Lake, Fred Astaire, Alan Ladd, Jack Benny, Harpo Marx, Gregory Peck, Mickey Rooney, Ronald Reagan, and more stop by to exchange gibes with George, be baffled by Gracie, and delight audiences with their playful side. Includes 16 digitally restored and remastered episodes, and a program guide by radio historian Elizabeth McLeod.